Life Insurance Corporation of India, India’s largest insurer has recently launched LIC’s e-Services to provide repository services. Paying premium of policies, Calculate the loan available and loan availed, view the policy image, know the bonus, loan and claim status of policies, getting revival quotations. All these and more from the comfort of your house and that is what LIC’s e-Services is intended. LIC of India has completely redesigned and revamped its popular eServices portal for customers and launches ‘Premier Services‘ to offer streamlined services. Read complete details on LIC Premier services and revamped eServices. IRDA has made it mandatory for every insurer to provide policies in demat form through repository services. LIC has revamped its customer portal into e-services, so that it will provide customer service and repository services in a single portal. LIC’s e-Services empowers customers to do a variety of policy servicing related activities without the need of visiting branch office or getting the help of an agent. This service will be a boon to many customers including NRI’s who cannot visit the branch office that often. Some of these services were already available through customer portal but now LIC has decided to streamline the customer service operations and take it to the next level. Linking LIC’s prestigious project, Enterprise Document Management System (EDMS) with customer portal is also expected to take policy servicing to the next level. Every existing policy holder of LIC of India can register and avail these services absolutely free of cost. Existing customers who have already registered for customer portal of LIC can use this service using existing user name and password. How to enrol for LIC’s e-Services. First and foremost thing to use this service is to register and enrol for e-services. Registration is a one time process which involves just three steps, which you can complete in a few minutes of time. Before starting the registration process just follow the check list given below for an easy and uninterrupted registration. Go to the website of LIC – “www.licindia.in” or you can click here to reach there. Locate the link, LIC’s e-Services in the left side and click the link to get a new screen having two buttons “Registered User” and “New user”. 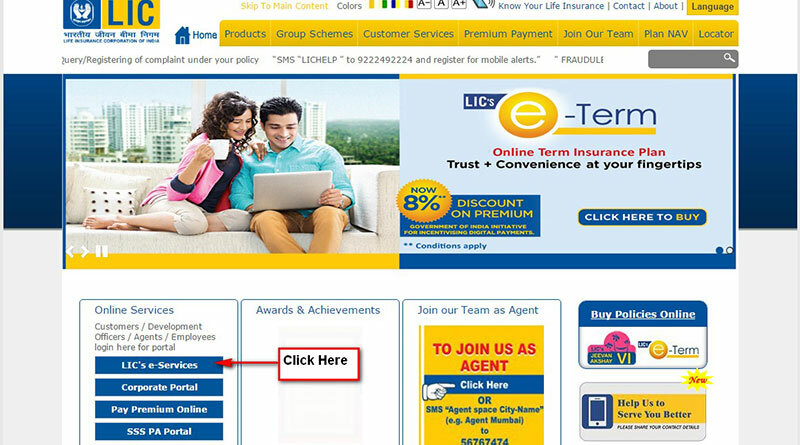 If you are a registered user of customers portal of LIC you can use the “Registered user ” Link. Use “New User ” button if you are a new user. On clicking new user button you will get a screen as shown here. Fill the details and click “Proceed” to create a user ID and password. Login to the e-Services portal using the user name and password created using the “Registered User” Link. Now you can enrol your policies from the link provided in the left side under the section “e-Services tools”. You will be prompted to give your policy numbers and premium. Fill the form and enrol your policies. Before enrolling the policies of your spouse and children go to “Update profile” and add Name and date of birth of your spouse and all your children in the profile. Now you can enrol the policies of your wife and children also to the portal. 3. Printing enrolled policies list. You can print the list of enrolled polices from the link provided in the “home” screen and get it signed by your self. 4. Scanning and reducing the size of documents. Scan a copy of the signed list of enrolled policies and the ID proof (PAN Card, Aadhar or Passport) and save it to your computer. Remember to reduce the size of the file to less than 100 KB. You can achieve this by editing the scanned copy using “Photoshop”. If you don’t have a scanner at your disposal you can use your smart phone also. Install Cam Scanner form play store to convert your smart phone into a good scanner. Now you can upload the document using the link provided in the home screen of the site. You will get intimation through email once the verification process is over. Verification process will be completed in less than three days. Once the enrolment is successful you can use all the features in the e-services portal. List of services already available in the e-services portal is given here. The list of services currently offered will be enhanced in the future once the system is stabilised.You can expect many more things in the future and for that just check back to your portal once in a while. If you are already an e-services user, you can enrol your new policy at the time of completion of proposal, automatically by providing an addendum supplied by LIC along with new proposal form. Click here to download the addendum. You will get policy certificate on priority basis and images of the proposal and policy bond will be available through e-services. Download stand alone Income Tax Calculator. Health Insurance Plan from LIC of India . Thank you. Please stop by when you have time..
Any option for paying loan interest through online ligin? As of now there is no option to pay loan interest through online method. Thank you for your comment. There are so many enhancements and additional features in new LIC’s e-services portal. Check availability of policy documents and proposal forms for example. Is it possible to cancel all ECS with my LIC policies through eServices? The problem is my ECS registered with LIC does not work and I have to pay premium with extra charges. I had given request to cancel my ECS due to this. But they have not done so in spite of my repeated requests. Cancellation of ECS is not possible through eServices. You will have to approach the branch office and change the mode of the policy. sir, i cannot upload the premier form within 100kb. is their any way .i can,t know photoshop to adjust the requiredsize. pl.inform to upload the same. You can contact any local studios using photoshop to reduce the size of the documents and copy it in a pen drive and then upload it. There are some android apps also available for photo resizing. SIR I AM JOB IN DEFENSE , I BOUGHT A POLICY NEW JEEVAN ANAND 815 KYA MUJHE ISS POLICY ME RISK COVER BENEFITS MILEGA ……….